PICATINNY ARSENAL, N.J. (Oct. 5, 2015) — Army engineers, who are seeking to adapt ongoing research to counter aerial systems that could threaten Soldiers, successfully shot down two aircraft as part of their final technology demonstration. Although the research project began with the objective to counter rockets, artillery and mortars, the project scope was expanded to include threats from unmanned aerial threats, sometime called drones, whose use has expanded rapidly. “It’s unbelievable how much it’s exploded,” said Manfredi Luciano about the use of drones. “Every country has them now, whether they are armed or not or what level of performance. This is a huge threat has been coming up on everybody. It has kind of almost sneaked up on people, and it’s almost more important than the counter-RAM threat.” Luciano is the project officer for the Enhanced Area Protection and Survivability, or EAPS, Army Technology Objective. The technology is being developed by the U.S. Army Research, Development and Engineering Center, or ARDEC, at Picatinny Arsenal. Funding for development and testing was provided by the ARDEC Technology Office. 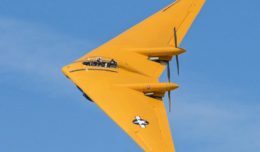 The challenge has increased exponentially in the last decade as the world’s inventory of unmanned aircraft systems, or UASs, has grown from approximately 20 system types and 800 aircraft in 1999, to more than 200 system types and approximately 10,000 unmanned aircraft in 2010, said Nancy Elliott, a spokeswoman with the U.S. Army’s Fires Center of Excellence on Fort Sill, Oklahoma. Although a missile-based Counter Rocket, Artillery, and Mortar, or C-RAM, defense system has been selected as the technical approach for the Indirect Fire Protection Capability Increment 2 Intercept Program of Record, the gun alternative continued to mature as force-protection technologies for other potential applications. During the final testing Aug. 19, at Yuma Proving Ground, Arizona, engineers shot down two class 2 UASs using command guidance and command warhead detonation. The UAS was an outlaw-class aircraft, a product of Griffon Aerospace, and the intercept engagements occurred at over a kilometer range and about 1500 meters. The first shoot-down at the kilometer range was a replication of the test performed April 22, in which the EAPS technology first successfully intercepted a loitering UAS. Some fire-control improvements were made after the April 22 tests, and were validated during the Aug. 19 testing. The second shoot down was executed at a 50 percent greater range and exceeded the EAPS demonstration objectives. The Picatinny area-protection system tracks both the incoming threat and interceptor, then computes an ideal trajectory correction for the interceptor to maximize probability of mission success. A thruster on the interceptor/projectile is used for course correction. The ground station uplinks the maneuver and detonation commands, while receiving downlinked assessment data. The interceptor takes the commands and computes the roll orientation and time to execute thruster and warhead detonation. The warhead has a tantalum-tungsten alloy liner to form forward propelled penetrators for defeat of C-RAM targets, and steel body fragments to counter unmanned aerial systems. C-RAM stands for counter rockets, artillery and mortars. The integrated test demonstrated a proof-of-principle that direct fire, command guided ammunition can intercept and negate aerial threats, Luciano said. Technologies from the EAPS gun alternative Army Technology Objective, or ATO, may potentially be used for both Army and Navy air defense systems, he said. The August testing concludes the EAPS Gun ATO. ARDEC now awaits counter-UAS requirements. Once requirements are generated and approved, the technologies developed under EAPS can be configured to a new design for a future tactical system. The EAPS fire-control radar interferometer was designed, fabricated, and operated by Technovative Applications in Brea, California. Radar interferometers use multiple receive antennas to enhance angular measurements for centimeter tracking accuracy. 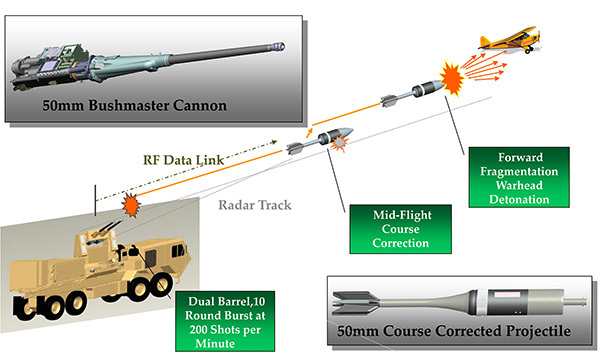 Design of the 50mm cartridge/interceptor was a collaborative effort between ARDEC engineers and Orbital ATK, Armament Systems Division in Plymouth, Minnesota. Interceptors were assembled by Orbital ATK and warheads by Aerojet Rocketdyne in Sacramento, California. The fire-control algorithm was a collaborative effort by the various subject matter experts but led and written by Propagation Research Associates, Inc., in Atlanta. The EAPS Integrated Product Team was led by ARDEC’s Munitions Systems and Technology Directorate at Picatinny Arsenal.